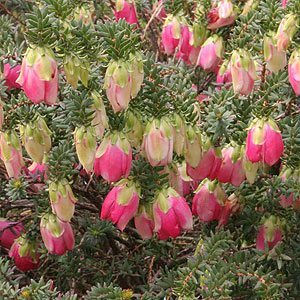 Darwinia plants are a varied group of evergreen plants from southern Australia. With over 70 species identified only a few are available from wholesale nurseries. They do make excellent garden plants and many have outstanding flowers. More often the grafted types are better in landscaping as they have more tolerant root systems. Some varieties have attractive large and colorful ‘Bell Like ‘ flowers others are smaller flowered and not widely offered for sale. All species require good drainage and all flower best in full sun. Most Darwinia species can be tip pruned to maintain a bushy habit. All require excellent drainage and a position in full sun. Common Name – Varies with species, often called Mountain Bells. Soil – Well drained – Water during very dry summers. Height – Varying from .1m to around 2m – 4m. Width – Varying to 1m, some prostrate forms are available. Habit – Small shrub depending on species and cultivar. Grown for the showy flowers, suited to native gardens as well as container growing. Darwinia macrostegia – Brilliant flowers red and white striped and the plant is often called the ‘Mondurup Bell’. Weeping shrub to around 1m. Darwinia meeboldii – Also known as the ‘Cranbrook Bell’, white and red flowers, bell shaped on a bushy shrup to 3m in height. Darwinia purpurea – Deep red to purple flowers, usually more red. Low growing spreading shrub to 1m. Darwinia oxylepis – Attractive red flowers, on a bushy shrub to 1.5m in height. Darwinia citriodora – Known as the Lemon Scented Darwinia, for the fragrant foliage. Small rosey red flowers. Both upright and prostrate forms are available. Wholesale propagators specialising in Australian Native Tubestock. Our list comprises of hard to grow and pictorial lines. Monthly & Annual Forward Order catalogue. Accredited to all States.